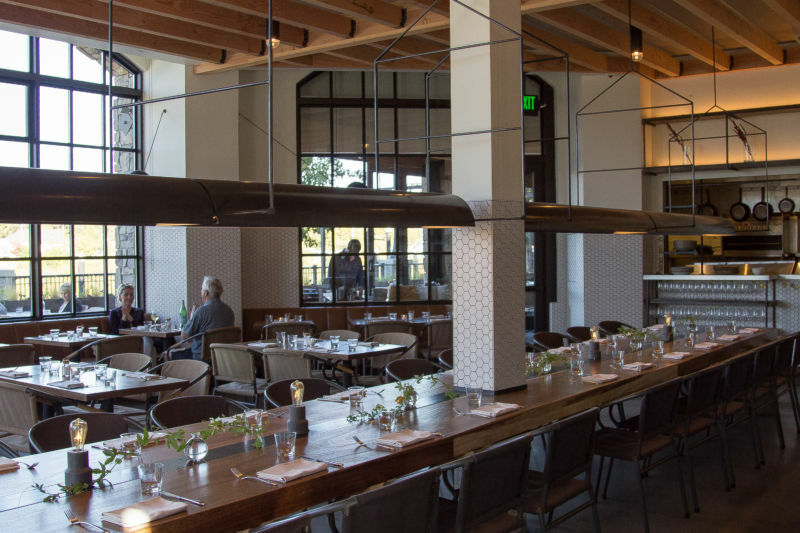 Sometimes it is hard to choose a restaurant in Napa. There are so many to choose from just in the downtown area. Luckily, the nice folks at Do Napa have organized a culinary crawl in the downtown area so we could try three restaurants in one night. 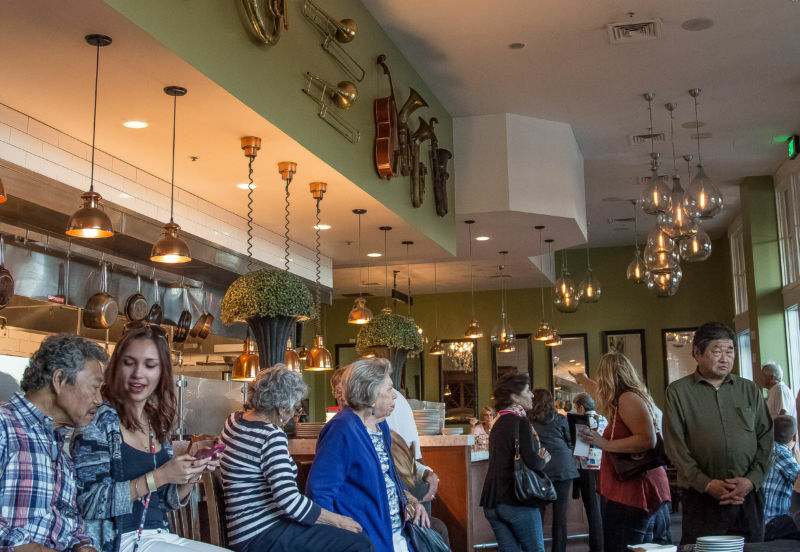 They hold these culinary crawls every other month on either the third or fourth Thursday. The next one will be in October. The price is a very affordable $30 per ticket and it includes all the food, but no drinks or alcohol. That is a bargain considering the quality of the restaurants to which they are taking you. We had no idea if it would be a course at each restaurant, just appetizers, or specialty items made for just this one event. It ended up to be “bites” of food that are actually served in the restaurants we were visiting. I liked this concept. You can get a taste of each place without a big financial or culinary commitment. Plus bites can’t have as many calories as a whole meal, right? We arrived a little after the start of the event as there was horrible traffic blocking the intersection of the 12 and the 121 highways. It looked like there was a serious accident, and it really backed things up. I hope everyone is OK. When we arrived at Basalt, we quickly found seats in the section in the back for the event. Apparently we missed out on the raffle tickets being handed out so we weren’t included in the first draw. That was a bummer. They gave away two gift certificates at each restaurant we visited. We ordered glasses of wine and were pleasantly surprised at the great Happy Hour prices. 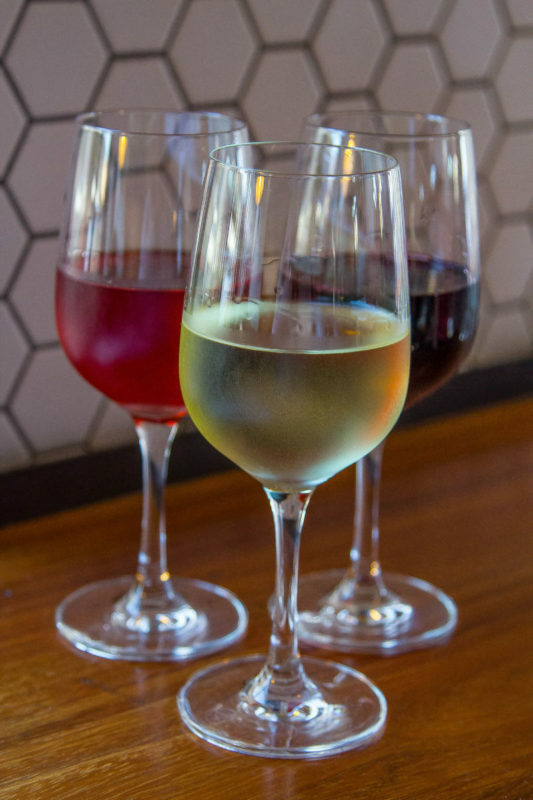 There were three of us attending; we had a glass of the house white (Sauvignon blanc – from Black Stallion Vineyards) the rosé, and a Spanish red. Out of the three, I have to say the Spanish red was the best of our selections. As we got our first sips of wine, the waiters started passing out bites of food. 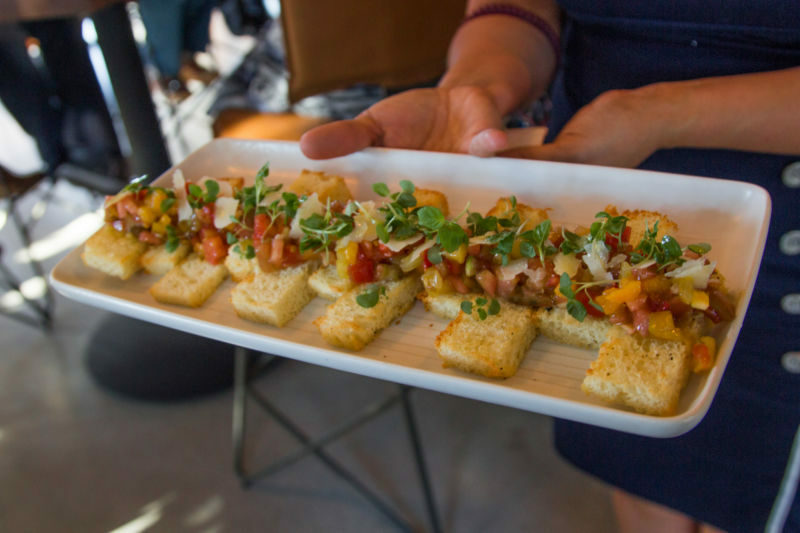 The first bite was the most amazing heirloom tomato bruschetta I have ever eaten. It was just beautiful. The bite was served on toasted brioche. The tomatoes were at the peak of perfection, tossed in a gorgeous olive oil, and accented with a tiny bit of basil and watercress. Our second bite was wonderfully different. 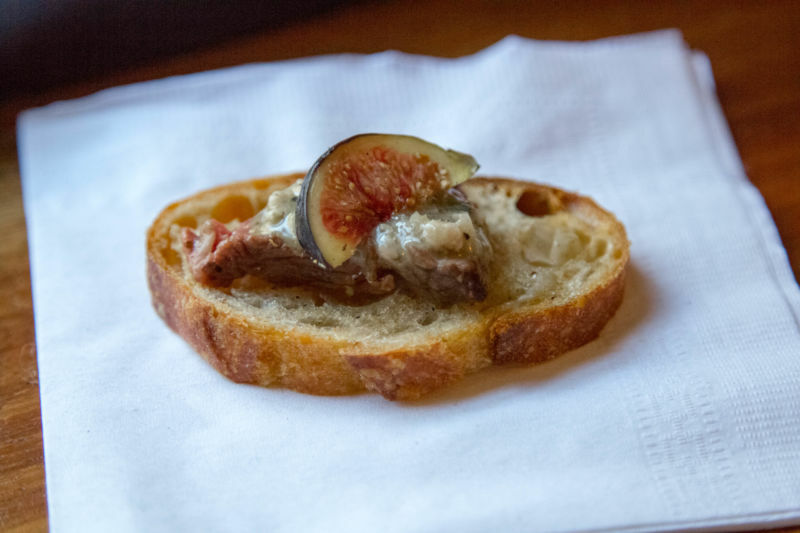 A lamb and fresh fig crostini with a blue cheese sauce. It was such an unusual, but delicious, pairing. At this point, I was so impressed with the chef, that this restaurant went down on my must visit list for a full meal. 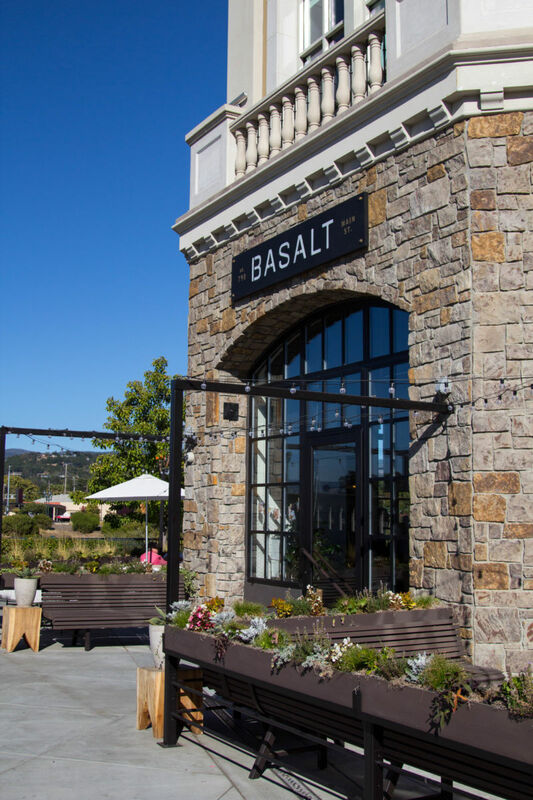 The Brit comments: I was impressed with the food, the service, and the drinks menu at Basalt. 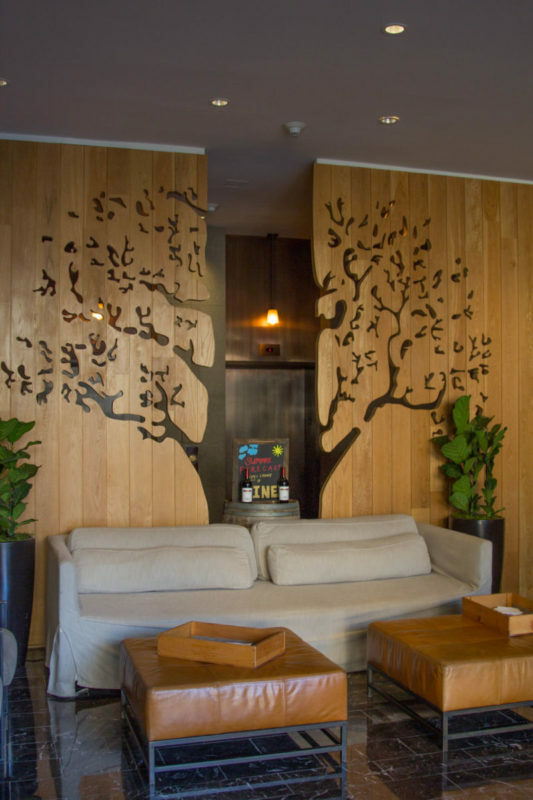 Should we find ourselves in Napa again, an event that is not exactly impossible, this place will be at the top of the list of restaurants in which to dine. 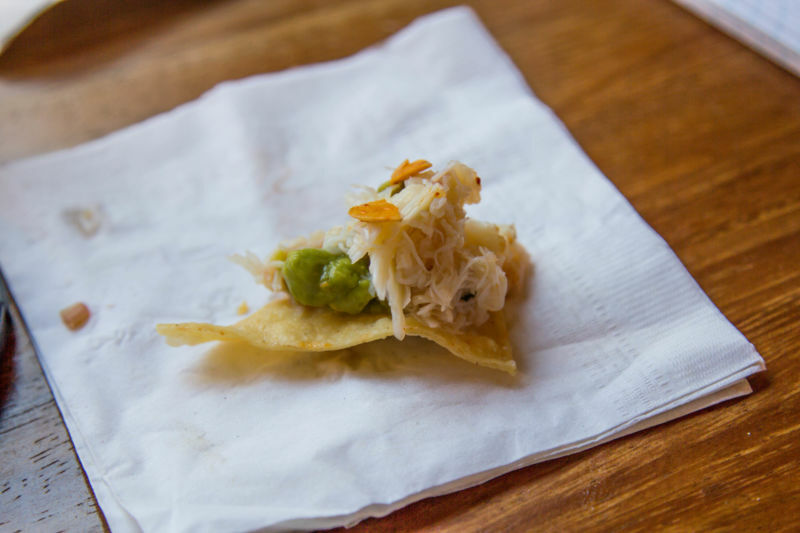 The third bite provided was a crab salad on a tortilla chip, garnished with guacamole and spiced nuts. The Brit doesn’t tend to go for such things but even he enjoyed the flavor. It was delicious! I really liked the way this restaurant served the food and organized how their part of the event went. 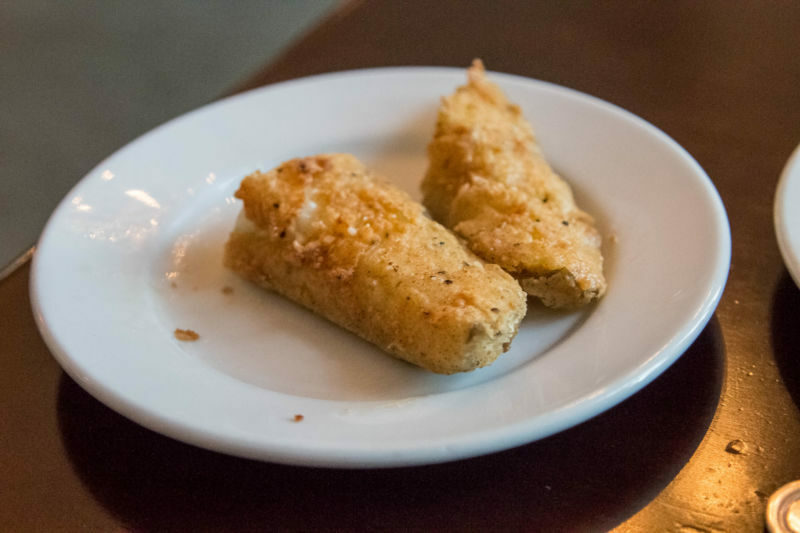 I wish we had plates and not napkins for our bites, but it didn’t take away from their wonderful flavor. 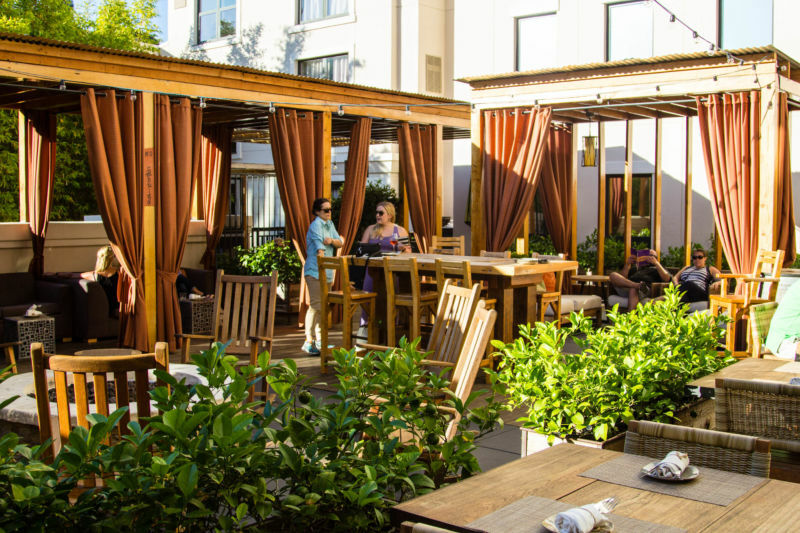 After about an hour it was time to move on to the next venue: Mercantile Social Terrace at the Andaz Hotel. I really should have looked more closely at the location of this middle restaurant when dressing that day. I thought they were talking about the hotel in the same riverfront area as Basalt, but no, it is way up in the upper part of downtown. That would have been fine except I was wearing HUGE heels as I wasn’t expecting to walk 15 minutes. My feet weren’t thanking me. 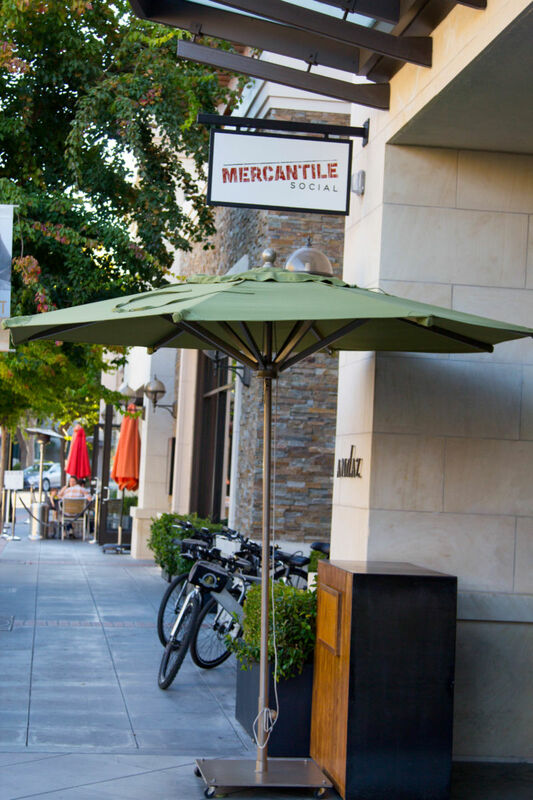 Once we got to the Mercantile Social, I breathed a sigh of relief. The hotel interior is very pretty; rustic and modern at the same time. 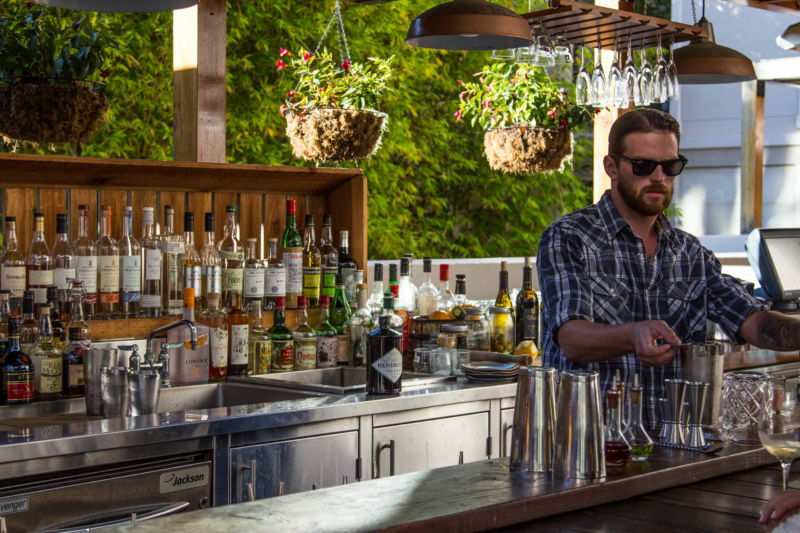 I have heard nice things about their full restaurant Andaz Farmer’s Table. However, we were going to enjoy our bites at the outside Bar/Terrace area. What I didn’t realize was it was on the roof! What a surprise little oasis it is up there. The Brit comments: I took one piece food for each of us and heard a woman comment about me taking three pieces of food. The comment delivered in a tone that dripped disapproval. It was the one sour note of an otherwise very relaxing and enjoyable day. It was here I got one of the best bites of the night. I think it is a tie for first place with the amazing bruschetta. 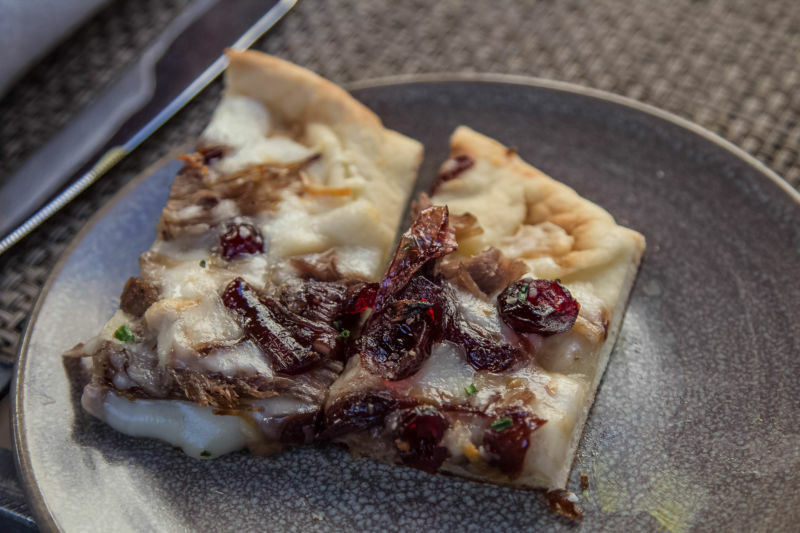 It was a duck and smoked cheese pizza with dried cranberries. Let me tell you, it was amazing. I would happily eat that again. They also served corn and cheese spicy hush puppies and a hot pretzel with warm beer cheese. The last item was underwhelming for me. For dessert they served a brownie bite and it was pretty good. I can envision The Brit and I going back there for drinks and that duck pizza. After an hour of grazing and consuming a glass of sparkling wine, we were ready for our final restaurant. The Pear Southern Bistro, which is back at the riverfront. My high heels and I tromped through the streets a little more content for the second glass of wine, but still my feet weren’t happy with me. We finally arrived at The Pear Southern Bistro. I knew of The Pear from stalking them on my Instagram feed. I was excited to try their food after seeing all of their beautiful posts. We piled into the restaurant and were seated around a large round table. The food was brought to the round table and the vultures (I mean attendees) all dived for the food. The Pear serves Southern style food, and they did bites of their popular dishes. That was nice for me to try it this way. They served chicken and waffles, mac n cheese, fried pickles, bacon wrapped shrimp with cheese grits, and potato croquets. They did serve plenty of food, but I could tell most of the people didn’t really go for the Fried Pickles. There were plenty of those left over. I really liked the flavor of the savory, spicy and slightly herb-ed fried chicken which was cooked beautifully (Congratulations to the chef for cooking such beautiful chicken). However, the waffles were heavy and on the stodgy side. 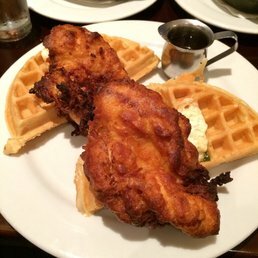 The cook was perfect on the waffle, I just wasn’t overwhelmed with the flavor. To me, the waffles tasted as though they were made from a corn based batter which made it heavy in the mouth. Maybe I am just unused to that type of waffle as I am not Southern. 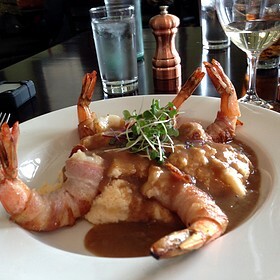 The bacon wrapped shrimp with cheese grits were wonderful. Perfect cook, great flavor. I am not even particularly a fan of grits and these were delicious. Our guest really enjoyed this bite and finished our plate as The Brit didn’t want to try them. The Brit comments: If you call a food “grits”, there is no way I am going to try it. The mac and cheese was disappointing. It was lacking in flair in my opinion and I thought they could have done far better with the dish. The cheese on top was a bit congealed and it was actually hard to cut through. The top cheese crust had the most flavor, but the rest was just bland and uninspiring. The fried pickles were an interesting bite, but honestly I would have preferred them to be sliced and not served as a spear. The crispy coating would have been better balanced with the strong vinegar dill. The winning plate in this restaurant for me were the amazing potato croquets. Wow were they delicious! 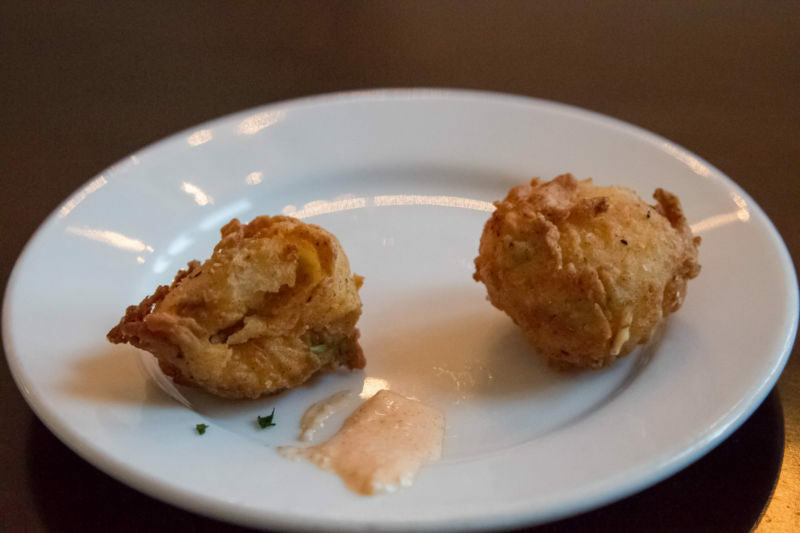 Soft mashed potato, cheese, and jalapeño; coated in batter and deep fried. Fantastic. The menu describes them as tater tots. The event was nicely managed although it would have been better had one of us won any of the raffle prizes! We all agreed we had a great time and can’t wait to do it again.